If you have missing teeth, dental implants can restore your smile and prevent movement of other teeth. 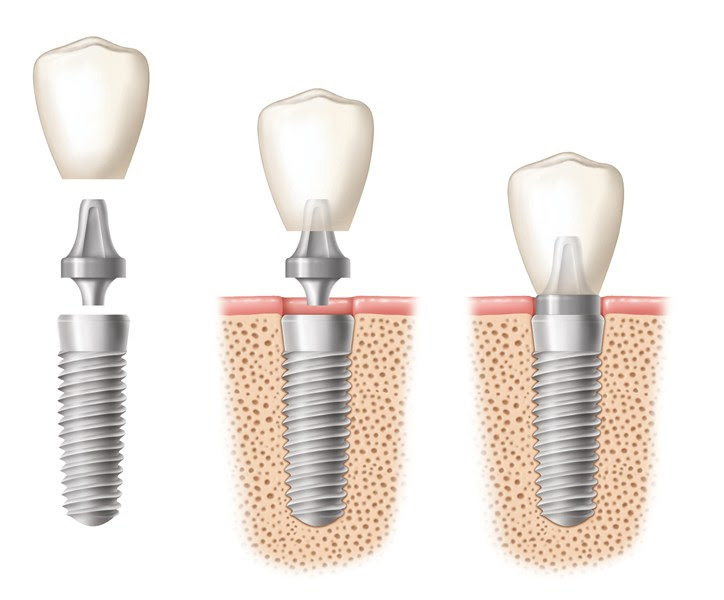 A dental implant is a titanium screw that is surgically inserted into the jawbone. The dental implant fuses with the bone and is used as the foundation for the crown (porcelain tooth) which is placed on top. When natural teeth are lost, the bone in that area shrinks and impacts facial appearance. Cheeks may look more wrinkled or shrunken. Implants stop the process of bone shrinkage and prevent your face from looking lined or aged. What is the procedure for dental implants? The dentist will evaluate your jaw and assess your treatment requirements. Imaging and xrays will be taken to make sure your bone levels are healthy. The implant is inserted surgically into the jawbone under local anesthetic. Crown is attached on top once the gum and tissue have healed. Depending on the type of implant and healing time, the procedure can take as little as a few weeks to several months. Each case will have different circumstances, and you will be advised at the start of treatment how long the process will take. Implants have long-term potential and should stay in place once they integrate with the surrounding bone in your jaw. But they are medical devices and need good care. Good dental hygiene routines and regular dental checks will help keep your implants healthy. Can implants be used if I have several missing teeth? Are implants right for me? Your oral and general health will be assessed by your dentist. It is essential that you have healthy gums and adequate bone to support the implant. Dental implants are suitable for people who are in good health. Chronic disease or habits such as smoking may reduce the success of implants so an alternate treatment may be recommended.